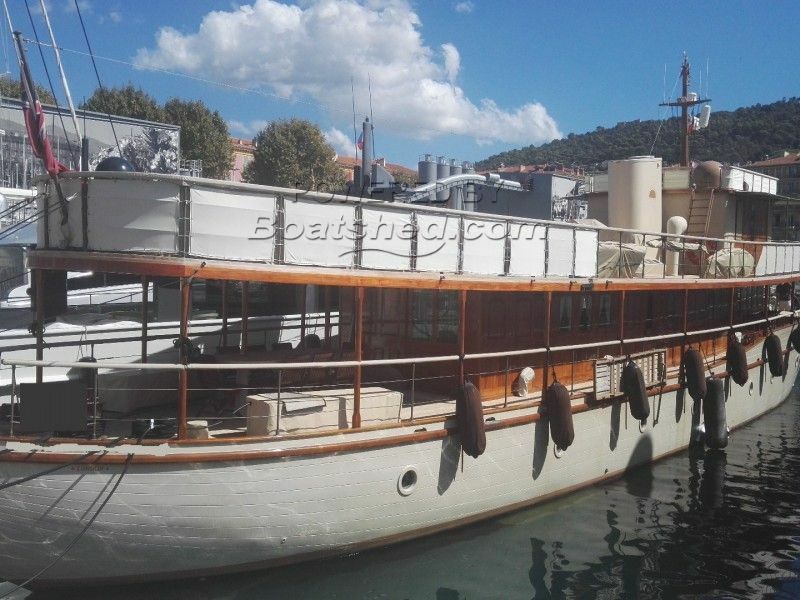 Built in teak over oak frames, this gentleman's motor yacht has had several lives. She was delivered in 1930 by the welsh yard Dickie & Sons on behalf of W.G Hetherington of Glasgow and spent nine years cruising around the Scottish coast until WW2 when she was used as a coastal patroller. During this time, the yachts dining room was used as the principal officer's mess and as his main leisure was playing darts, one can still see the marks on the mahogany panels where darts missed the target. After the war, the boat went to the US before coming back to the Mediterranean where she was used as a floating casino off the Greek coast, before disappearing for almost 40 years. She was then purchased by an English man who placed her on the charter market in the 1990's before being bought by a famous Belgian artist who had her fully refitted in 2004 after two years repair work carried out in Italy. Her engine room was also totally rebuilt. Composed of refined and very comfortable reception areas with several lounges and a large galley, she has three spacious double cabins and one twin. There is also space for five crew members. She has several toys, such as a 4 meter Williams Turbojet tender, a Waver runner Seadoo GT155, 2 single person kayaks, a wind surfer and a stand up paddle board. This Dickie & Sons Custom has been personally photographed and viewed by Solenne of Boatshed Riviera. Click here for contact details.